1. This is A-Grade Cross Pick which is different than most cross picks on the market. It's four direction blades are made of high flexibility strong carbon steel blade different from steel wire(easy to break). 2. It can insert into cross cylinder to open very smoothly. 3. This Dino's A-Grade Cross Pick includes 2 tension wrenches: one long tension wrench, one short tension wrench to fit for different size of cross cylinder and different size of thickness of door. It can open not only cross invisible door lock, cross dead bolt door lock, but also small size cross padlock, cross steering wheel lock, cross bicycle lock, small size cross cylinder... and so on. 4. There is signal on the black round turning bolt which is special designed to help locksmith to aim the center position while opening cross lock. 5. 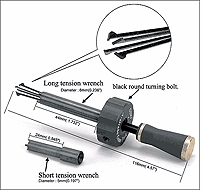 It is very easy to change and install tension wrench by a small screwdriver on side of black round turning bolt.